Next week at Love Books in Johannesburg, I will have the pleasure of talking to the author and photographer Réney Warrington whose debut novel October (also published in Afrikaans as Oktober) was one of my favourite reads of last year. At the moment, Réney is also exhibiting at the Circa Gallery in Johannesburg. From the few glimpses I have had of it online, I can’t wait to see the entire exhibition. Apart from sharing a publisher (Protea Book House), being debut novelists, and writing about sexuality and the trials and tribulations of relationships, Renéy and I have something in common which has resulted in a meaningful exchange of letters and messages in recent months: grief. We have both lost Loved Ones at the beginning of the year and are trying to find our feet in a reality completely changed by the experience. 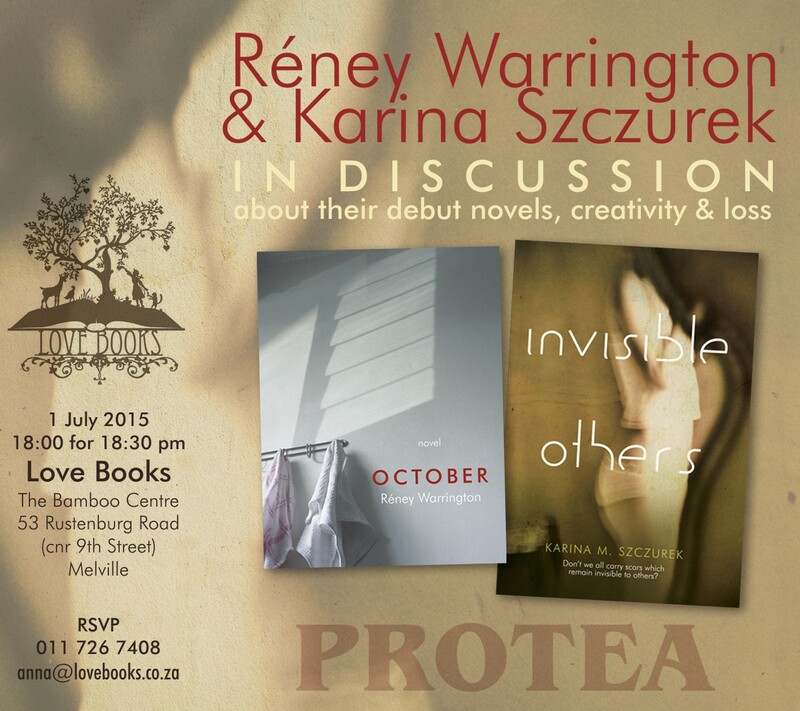 This entry was posted in Events, What I've Read and tagged debut novel, event, Invisible Others, Johannesburg, Karina M. Szczurek, literary event, Love Books, October, photography, Réney, Réney Warrington, talk, writing on June 23, 2015 by Karina.